Failed driver Makoto is ready to quit the business until he is approached by Hayami Go, who offers him a hyper-engine to change his fortunes. 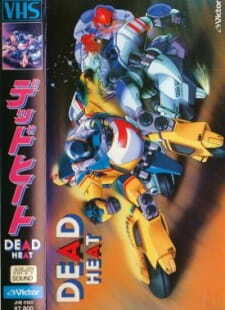 Claiming to be "Japan's first 3D anime," this curio using the VHD-3D system features 21st-century youngsters racing "FX" machines - predictable crosses between motorcycles and mechas. I would say that this is a decent short OVA that most people should enjoy if they adjust their expectations accordingly. With the OVA's description you would probably be thinking that I'm referring to the 3D aspect of the anime, but I am not. People that remember or at least know of the 3D booms in the US are sure to be thinking of features that are nothing but tasteless gimmicks that you could never get any enjoyment out of without watching it in proper 3D (though most of the time it was questionable if you would with the 3D). Thankfully though this isn't the case here, the OVA doesn't seem to only exist to show off the 3D system and even though there are times where the 3D gimmickry is a bit obvious it doesn't really hamper one's enjoyment. The reason that I suggest to adjust one's expectations is rather that this is very obviously an OVA that was meant to be a series but for one reason or another never made it past the first episode. Here we are pretty much just introducing the characters, their motives, and the general plot of the show. There is not much in the way of character development, since that would happen as the series went on, and the OVA is of course open ended. Otherwise, the story is presented nicely here and you get a good feel for the characters and their motives. The animation and art are pretty well down for an anime of this type and time period. The sound and music is mostly well done, the only thing that could have been done better is the opening that introduces the concept of the show with images and a text crawl. It is completely silent and could have used some music. Over all I would say that this is an interesting little OVA that you will most likely get enjoyment out of unless you are the stereotypical anime snob.